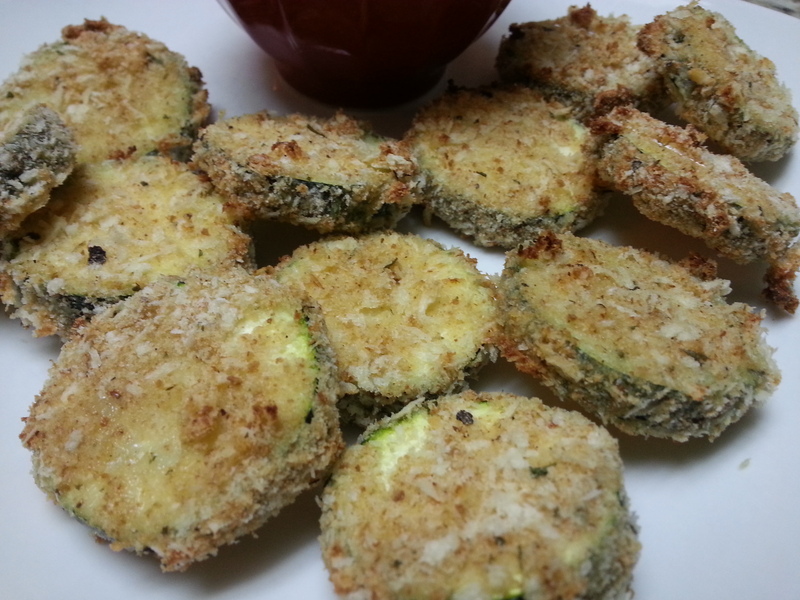 One of my favorite foods is fried zucchini! For many years, I was on the hunt for the perfect burger and fried zucchini. Because of course, they’re an awesome combo. I’ve found many I like, but let’s just say my quest still continues. Preheat oven to 400 degrees. Spray a cooking sheet generously with cooking spray. I used a tray that fit into the cooking sheet but after trying it once, I prefer to just lay the zucchini directly onto the sheet. In three separate bowls, add flour to one. Then add the eggs & milk to another, whisking together. 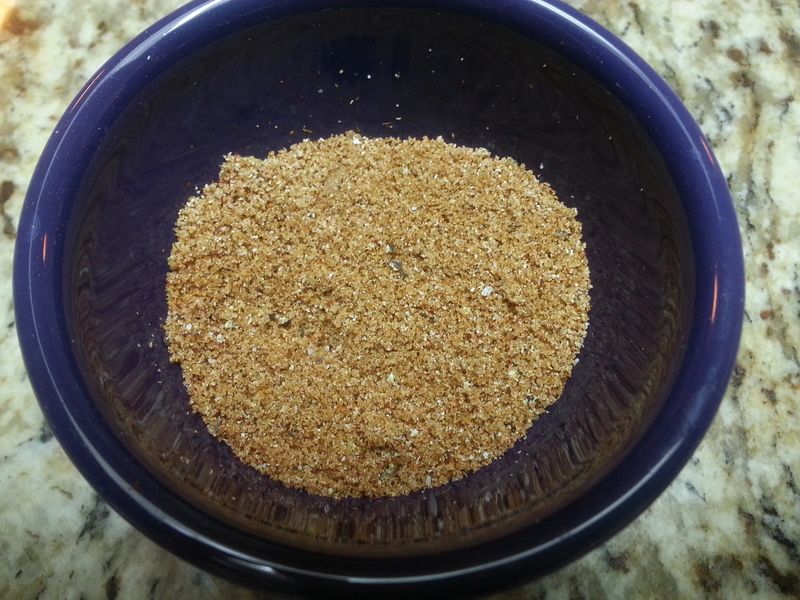 And in the last bowl, add both types of bread crumbs, along with the seasonings. Stir to combine. Then set up your dredging bowls as shown in the picture. 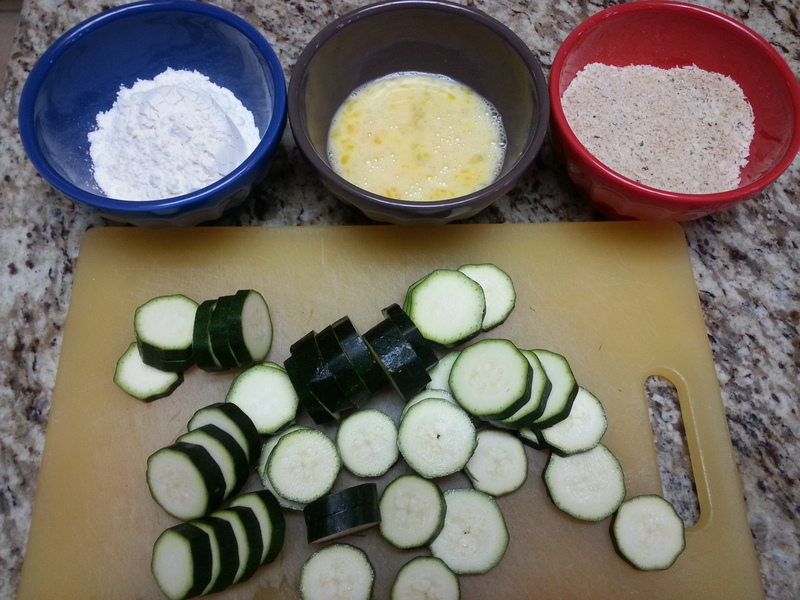 Take one piece of zucchini, roll it in the flour and then gently shake the excess off. Add the zucchini to the egg wash, making sure to coat the entire piece. 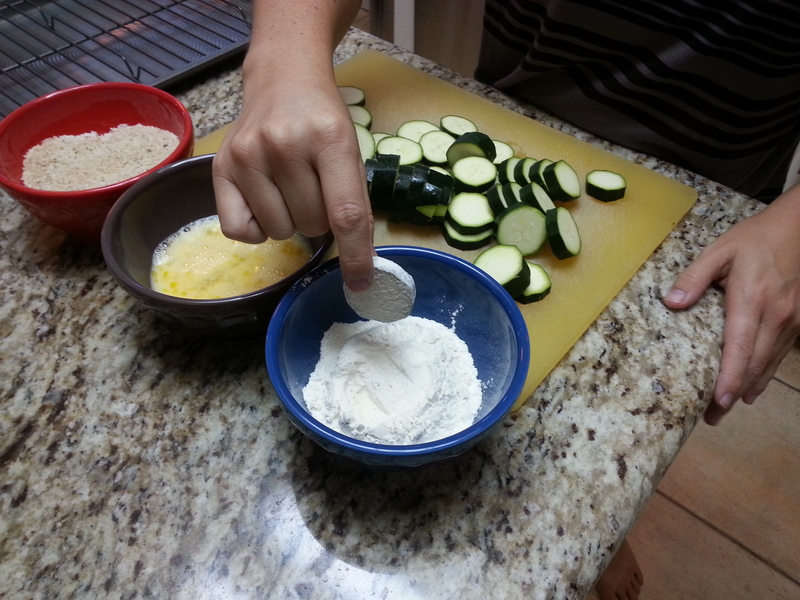 Then take out of the wash and add to the bread crumbs, pressing to adhere the crumbs to the zucchini. Lay on the sheet and then continue this process with each piece of zucchini. 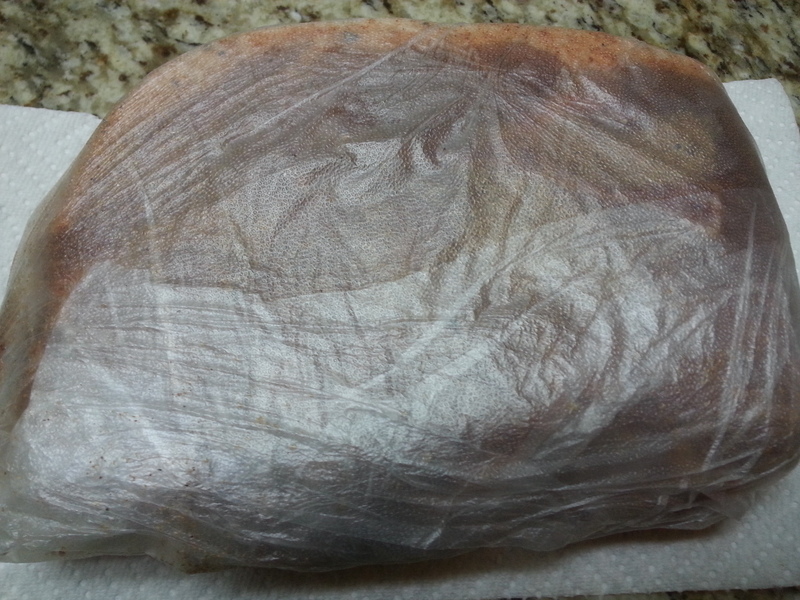 When completed breading, spray generously with cooking spray and put in the oven for 10 minutes. 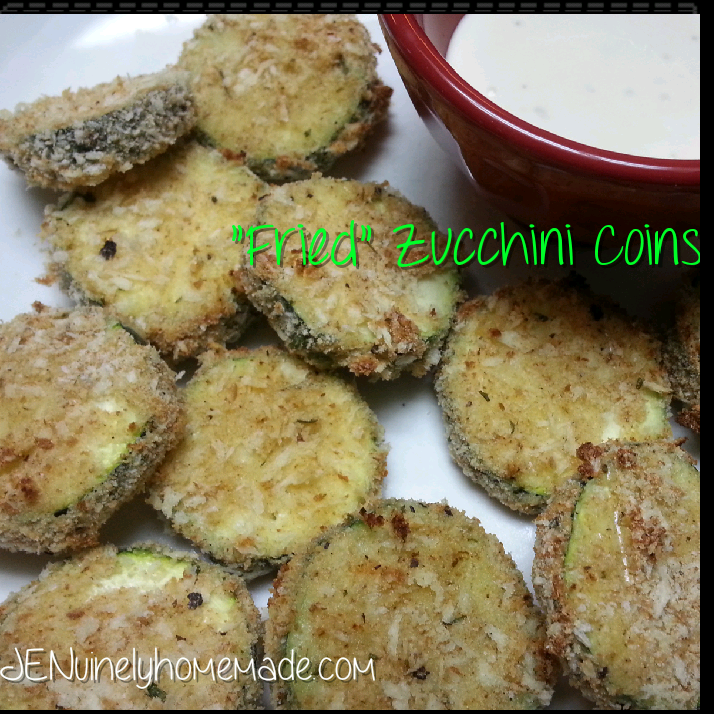 Flip each zucchini coin over and then continue cooking for another 7-10 minutes. This really depends if your oven cooks fast or slow. 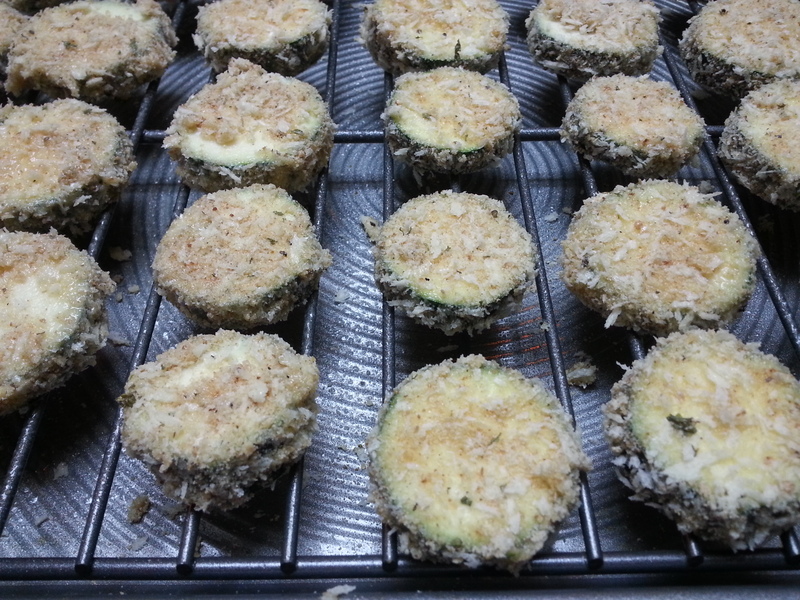 When zucchini is done, place on a plate and sprinkle with grated Parmesan cheese if you’d like. Serve immediately. Since this is baked and not fried, you will not get the traditional brown fried look. This zucchini slightly browns but still has that amazing crunch. 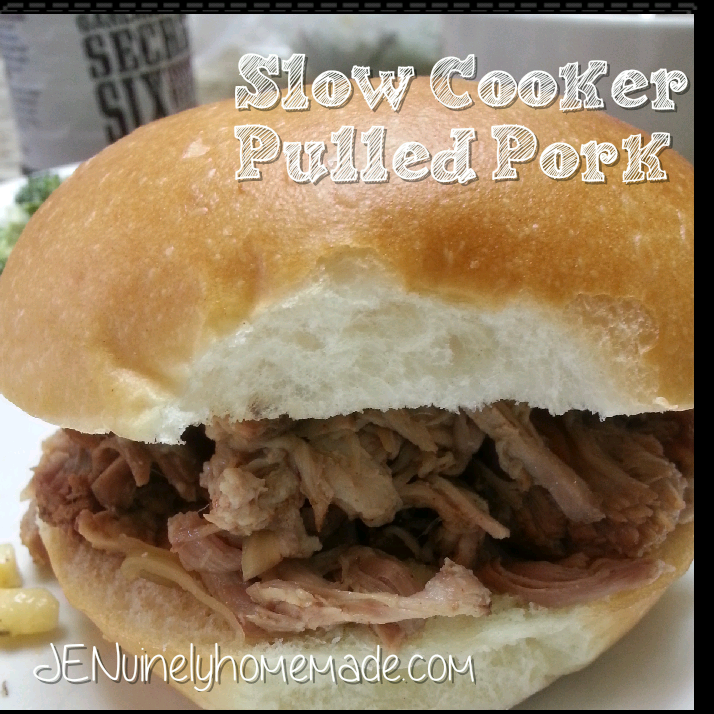 Serve it with ranch dressing to dip it in. There is literally no other way to eat “fried” zucchini. I think it’s illegal to eat it without ranch. Fall is here. But where I live, it really hasn’t felt like fall at all. Part of my weekend included wearing a tank top and shorts, wishing for a cool breeze as I sat watching my daughter’s softball game. It was downright hot in the sun! 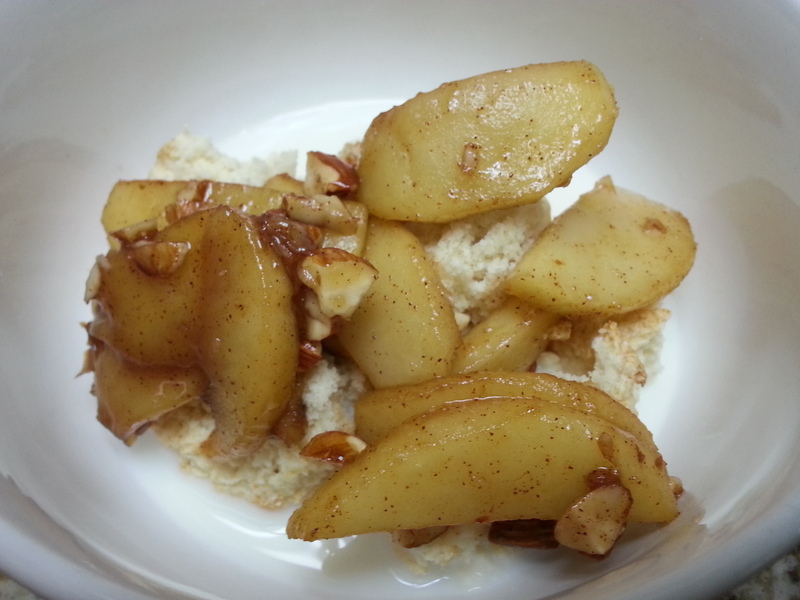 But a gloomy morning came to be the following day and desperately craving fall comfort food, I decided to whip up these apples. Hopefully to speed along the fall weather as well. Although it’s just wishful thinking, since the weather forecast shows 90’s midweek. This just doesn’t seem right for late October. But these apples tricked me a little into feeling like fall was in the air. Heat a pan over medium heat. Add butter and let melt. 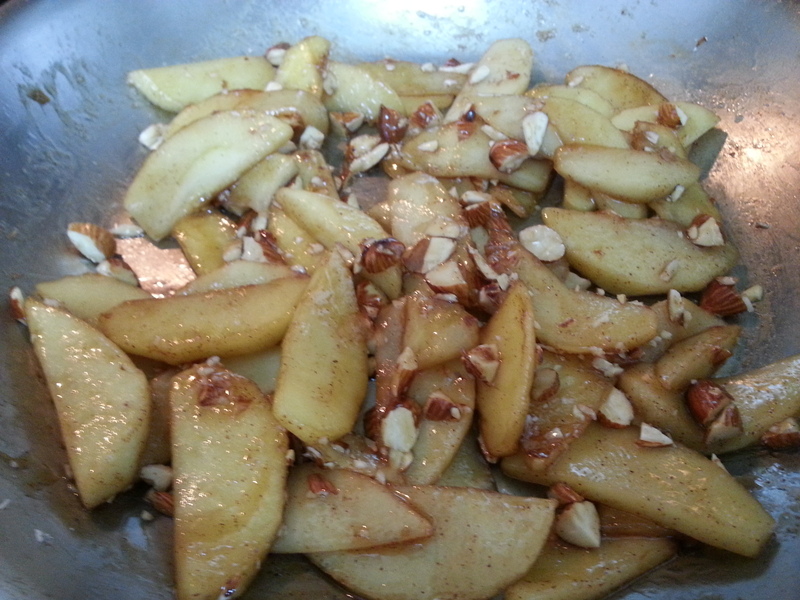 Add in apples and cook, stirring occasionally, for approximately 5 minutes or until tender. *Now here’s the optional part if you choose to do so. Remove the pan from the heat. Like away from the stove. Pour in the whiskey. Place pan back on heat. It will most likely flame up so stand back and BE CAREFUL. If it doesn’t flame up, slightly tip the pan towards the flame and it will then catch and flame up. The flames will die off very quickly. But please make sure you NEVER EVER pour hard alcohol straight from the bottle into a pan that is sitting on the heat. You can very easily catch the entire bottle AND yourself on fire. If you don’t want to use the alcohol or are afraid of setting yourself on fire, just skip this entire step. 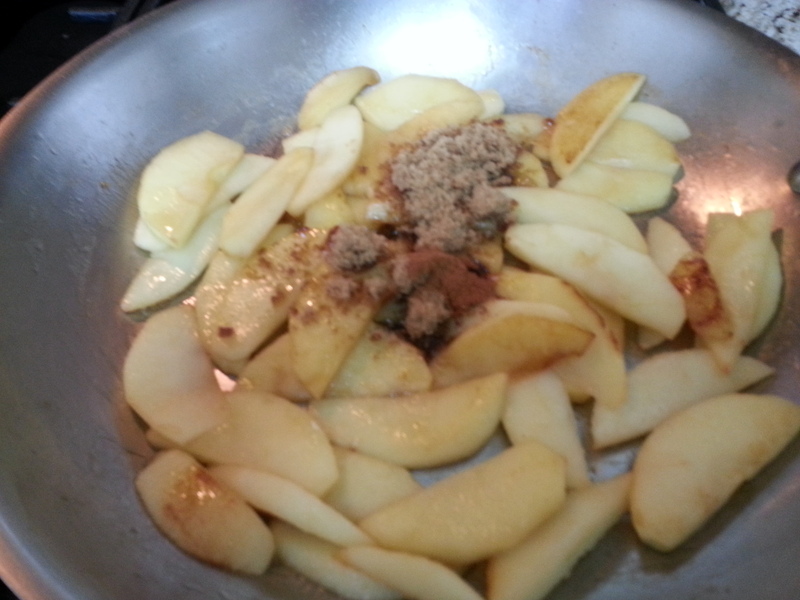 Then at this point, add in the brown sugar and cinnamon. Stir. Then add in the nuts and stir to combine. 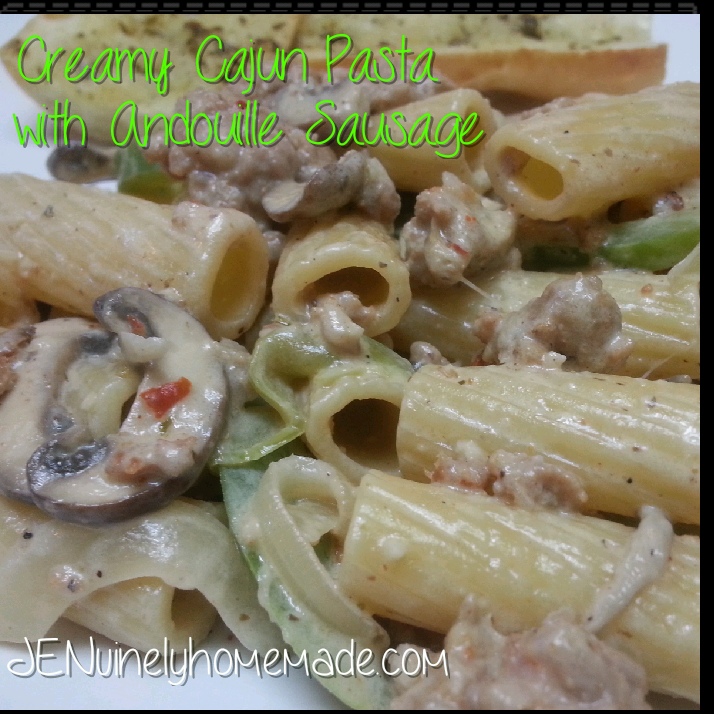 This recipe makes a smaller serving so if you’re wanting extra, you can easily double it. 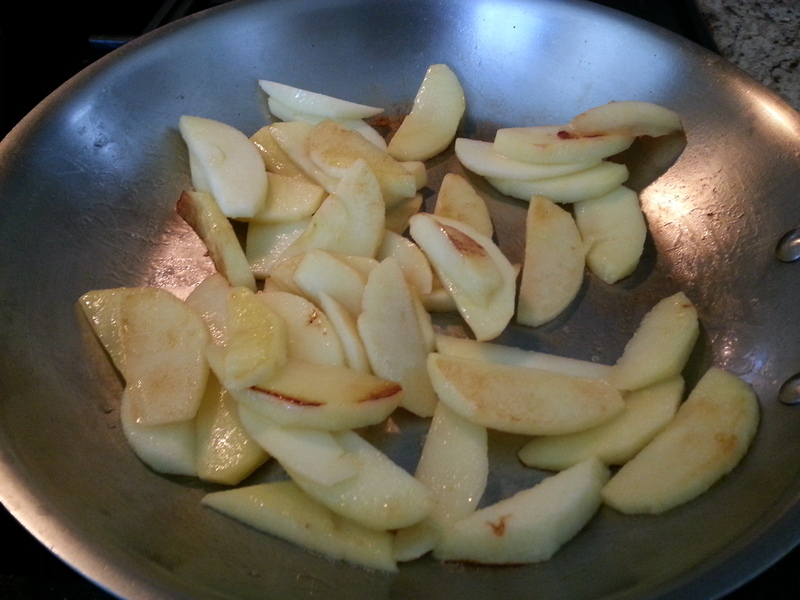 They’d also be great used in an apple crisp. 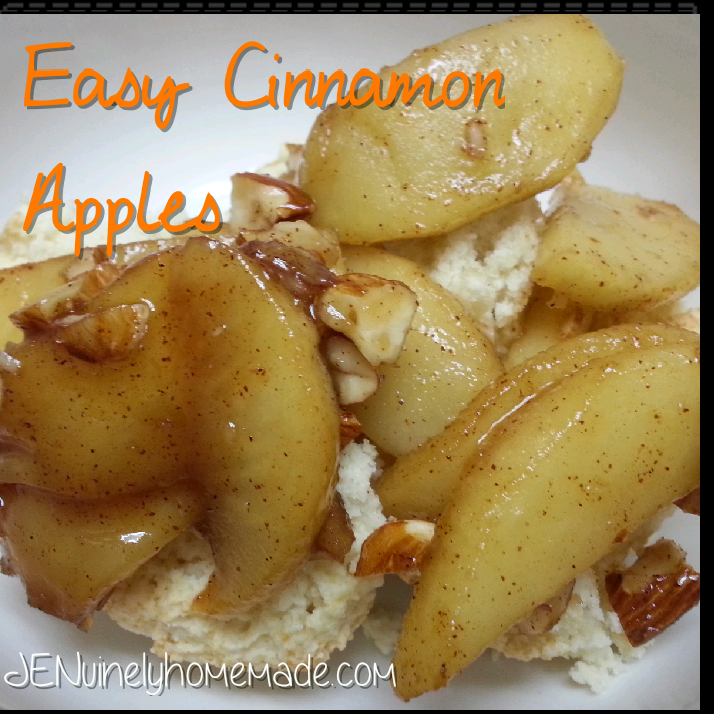 But I will definitely be trying them in a Cinnamon Apple Cobbler. Look for that upcoming blog post soon! Something that used to intimidate me? Dried beans. Yes, dried beans. As silly as it sounds! I’ve always been a canned bean kind of girl and it wasn’t until a couple of years ago that I decided to give dried beans a go. I knew they were time consuming (soaking them and cook time). But what I didn’t was that they are actually incredibly easy to make. And so much better tasting than their canned counterparts. And even though you’re supposed to soak them, it’s not a requirement. 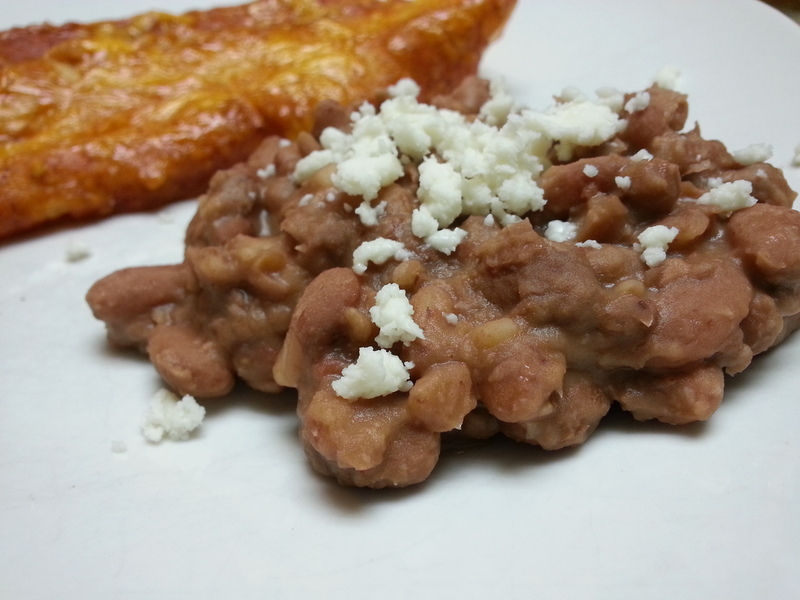 Truth be told, I’ve had quite the trials with my refried beans. There have been many a time where I’ve added way too much salt and they were basically inedible. 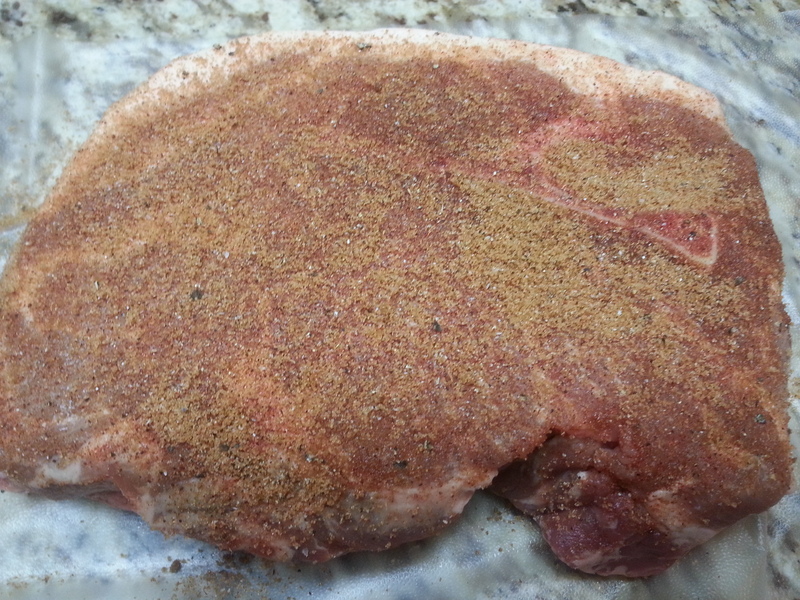 Or I didn’t let them cook long enough, and they really weren’t as tender as they needed to be. 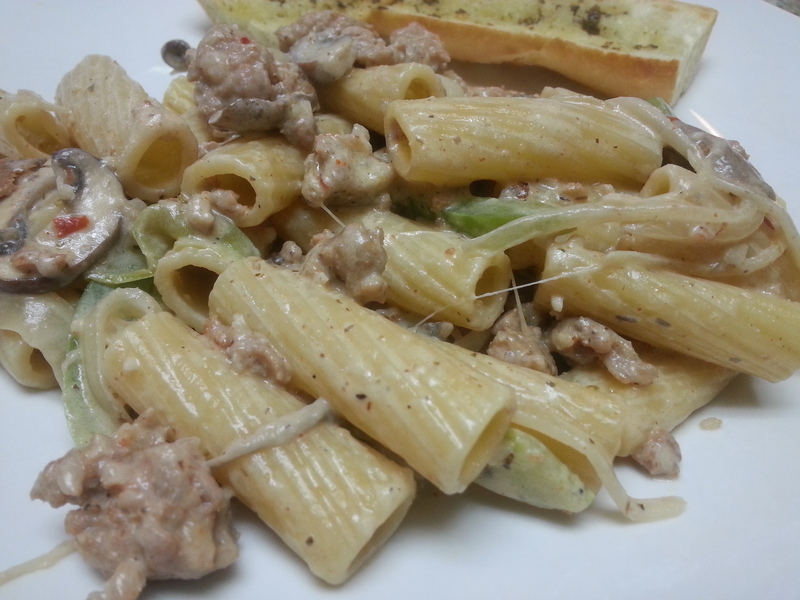 But lo and behold, here’s a recipe that works. 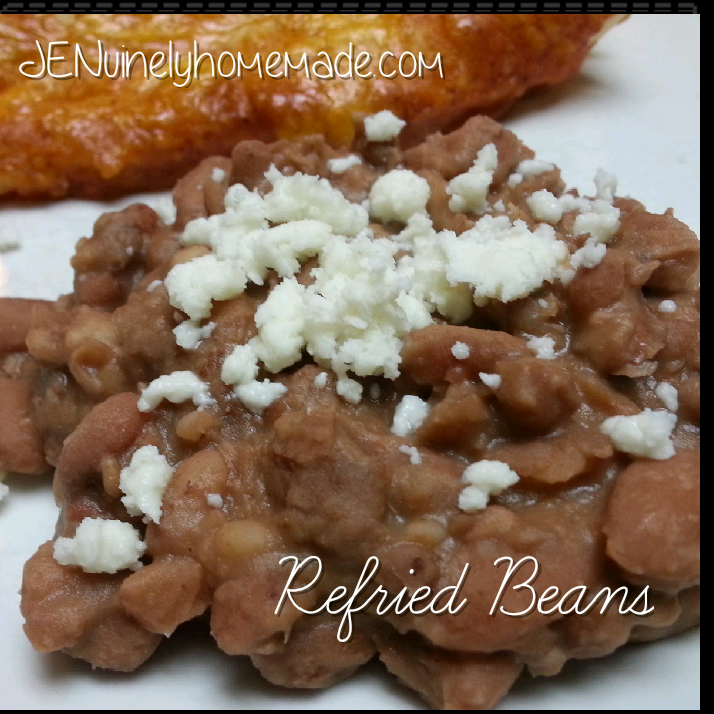 These “refried” beans taste pretty authentic. I use quotes because they are not traditional (no lard involved) however, if you can get that authentic taste at home, I consider it a win. I’ll say it before and I’ll say it again, getting authentic international flavor at home is hard to accomplish. I think that’s why so many people go out to eat, because you can’t get that same flavor at home. But here you go. Make this and you’ll feel like you’re at a Mexican restaurant. That’s in your very own kitchen. Rinse the beans. 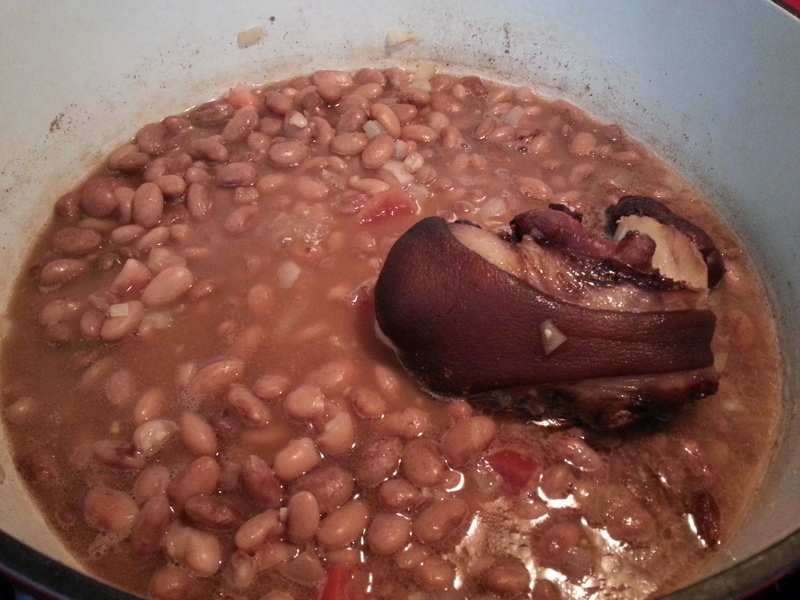 Add to a large pot (I use my Dutch oven) and fill with water to just about 1″ above the beans. Let soak. If you don’t have the time or you just simply don’t remember this, that’s okay. 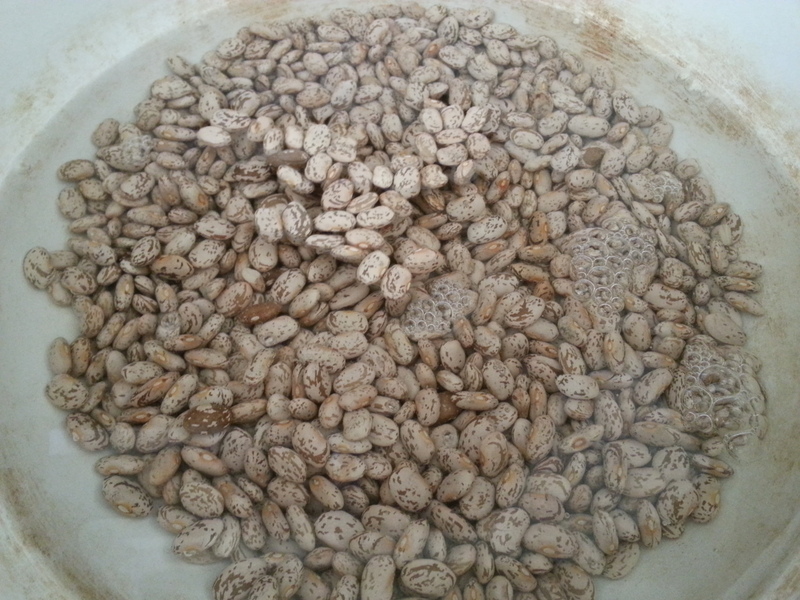 I think the longest I’ve ever let my beans soak is about 4 hours. 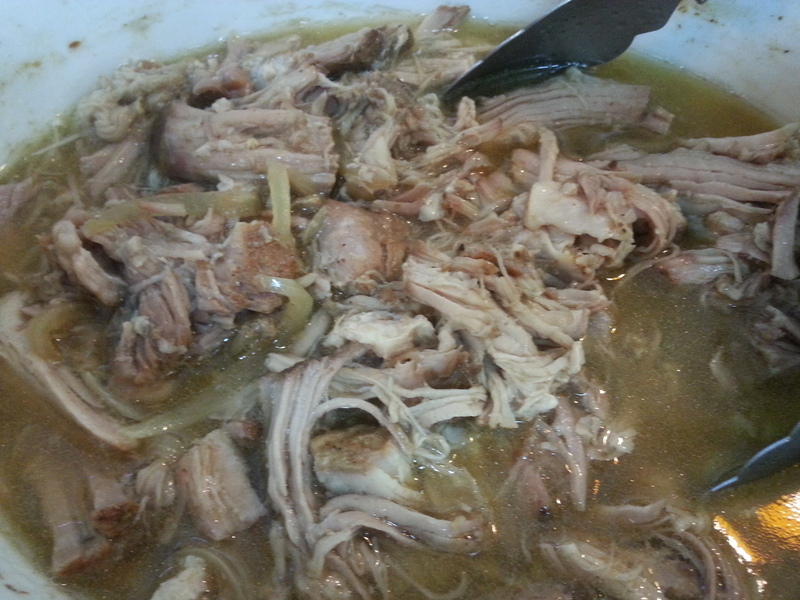 Add the ham hock to the pot. Heat the pot on high until it comes to a boil. 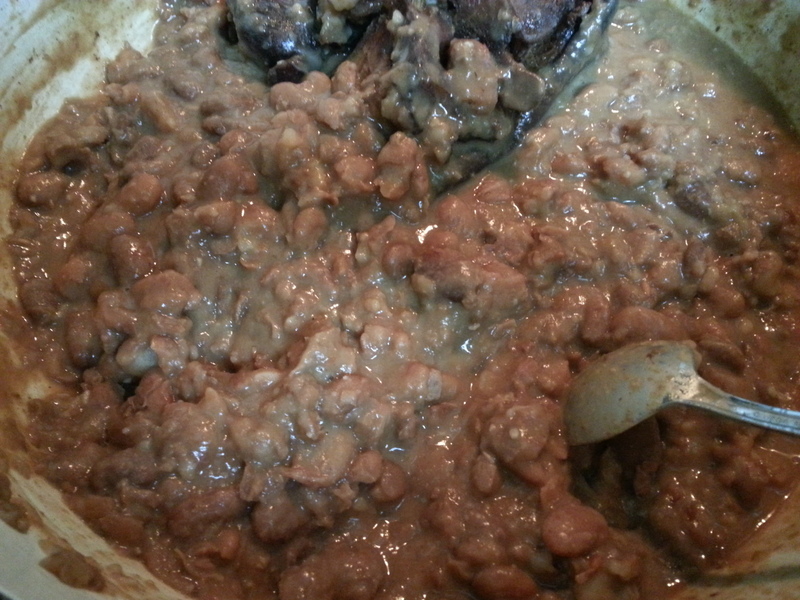 Cover with a lid, and reduce to a simmer for 3 hours if beans were soaked, about 4 hours if beans were not soaked. 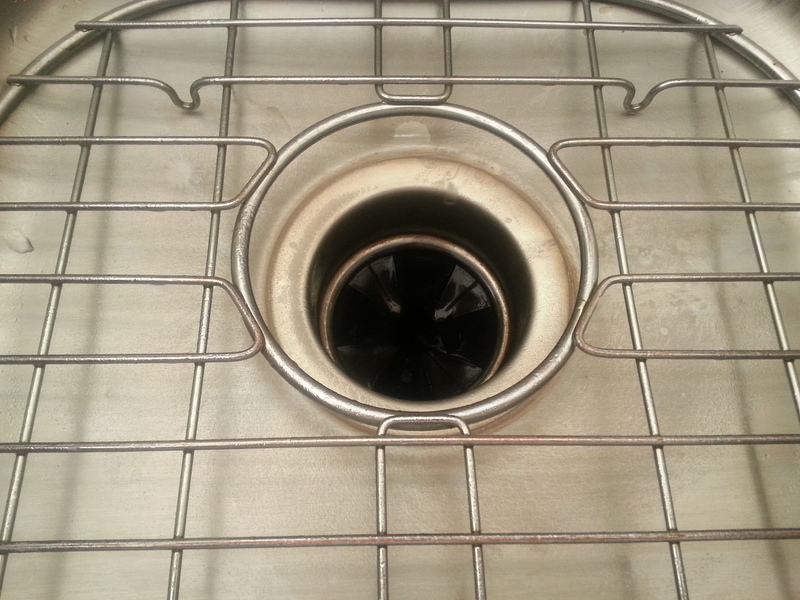 Make sure to check on these a couple times throughout the cooking time to make sure the water hasn’t evaporated. If you feel the water level is too low, you can add a little more water to the pot. 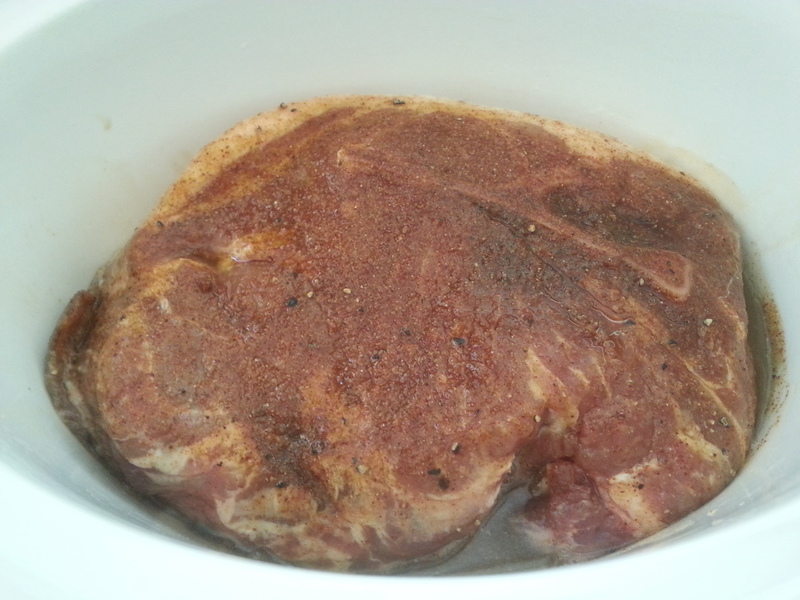 Remove lid and stir in the rest of the ingredients, except the bacon grease. 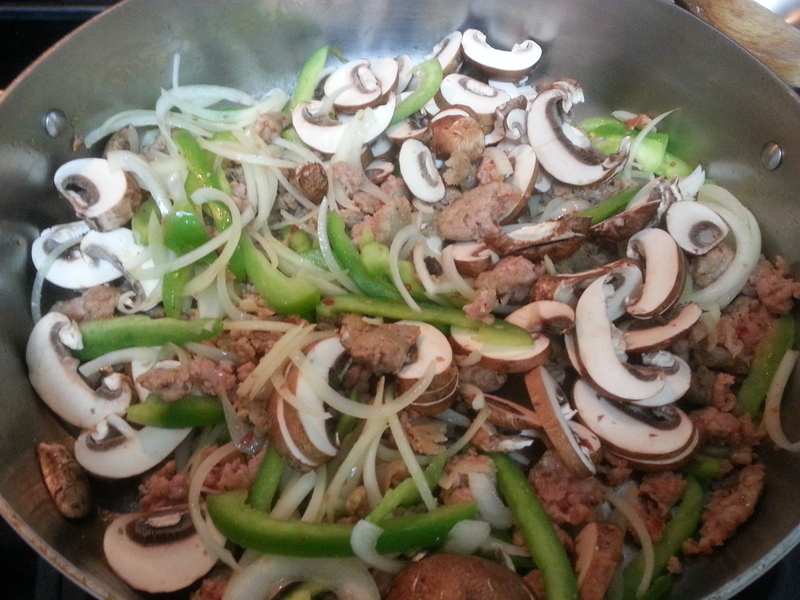 Cover with a lid and let simmer for an additional hour. After the hour is up, mash lightly (I use a potato masher) until your desired consistency and stir in the bacon grease until it melts. 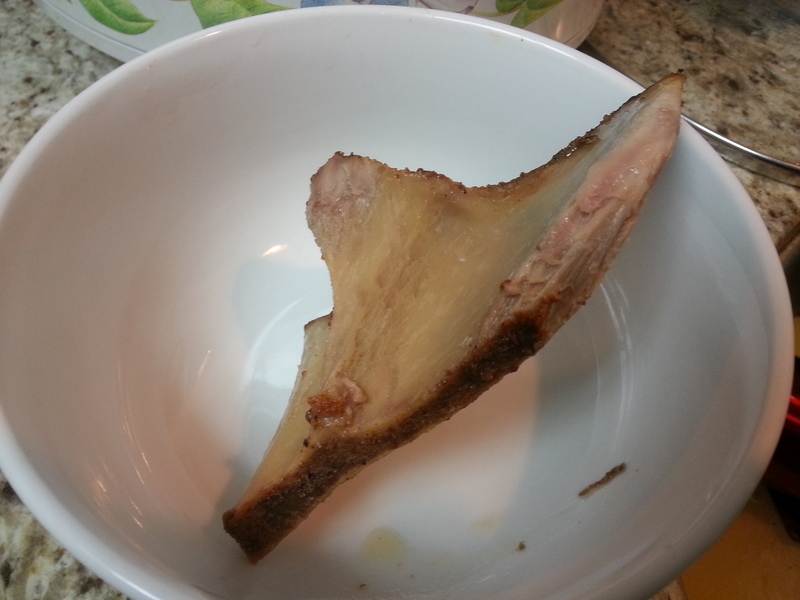 You can leave the ham hock in and mash around it or remove and discard. My dad loves them so when he’s over, the ham hock is his. But I just use it to flavor the beans. Also, if you feel the beans are too runny, you can let them simmer a little bit longer with the lid off until they thicken further. 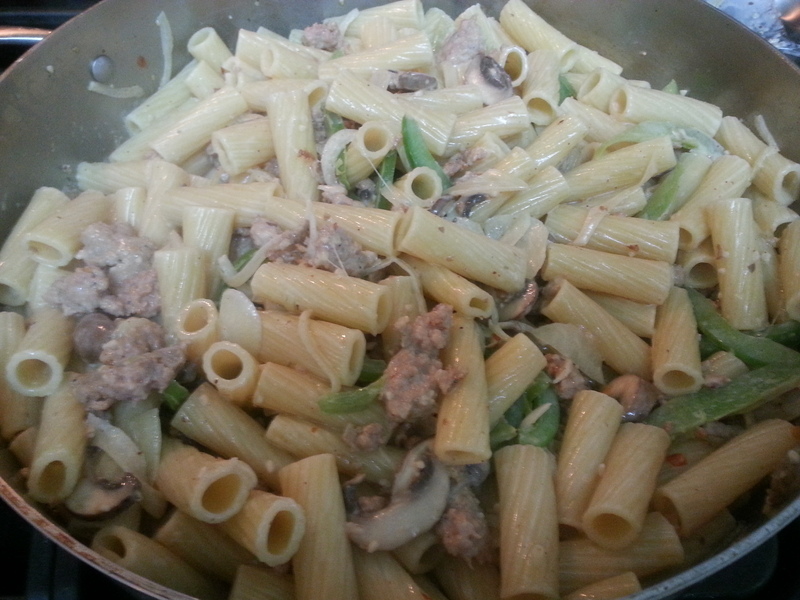 This recipe makes a large amount. 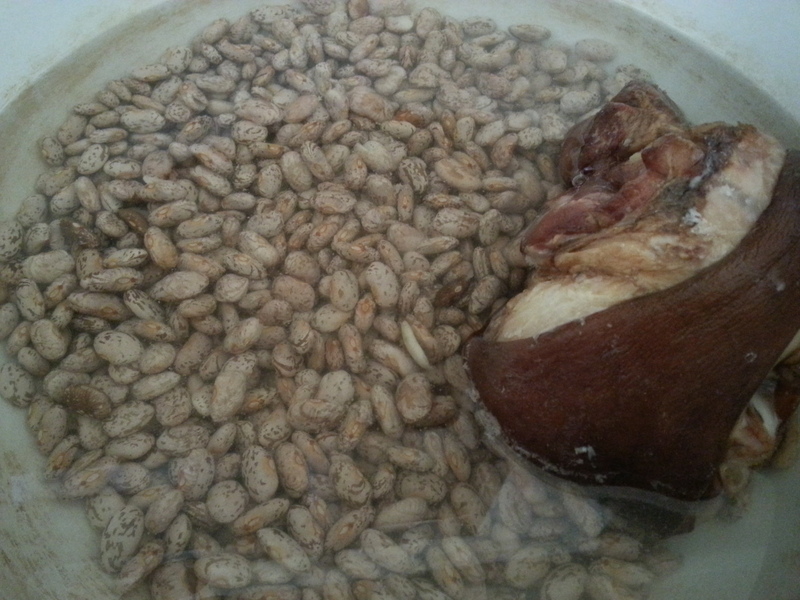 Enough so that I can usually freeze the other half which in my opinion, is so worth it so we can have beans at the ready for the next time we want Mexican. I don’t know about you, but texture means something to me when I’m eating. As in, I don’t want to eat a bunch of soft, mushy food. In my opinion, it’s always nice to have that little crunch or something to offset the food and add texture! 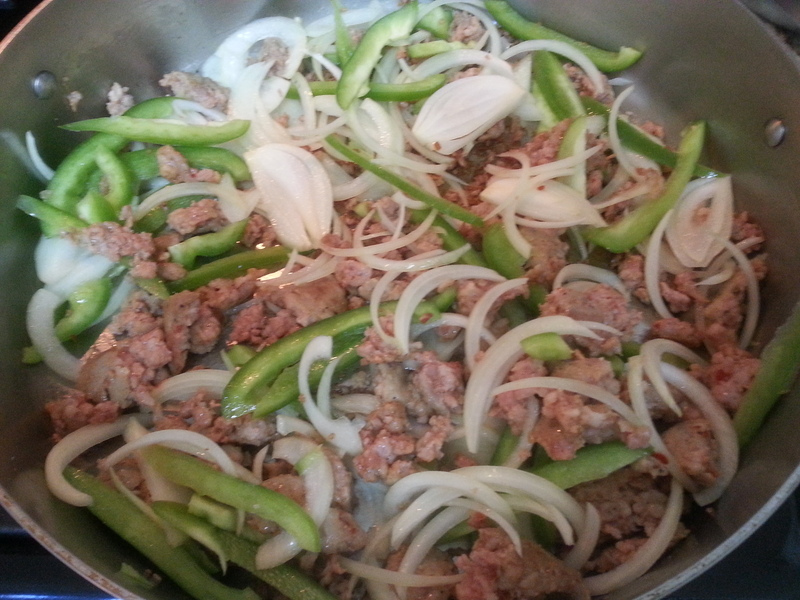 So this recipe (if you can call it that) will add just that the next time you have tacos. Especially if you’re going more traditional and having soft tacos. 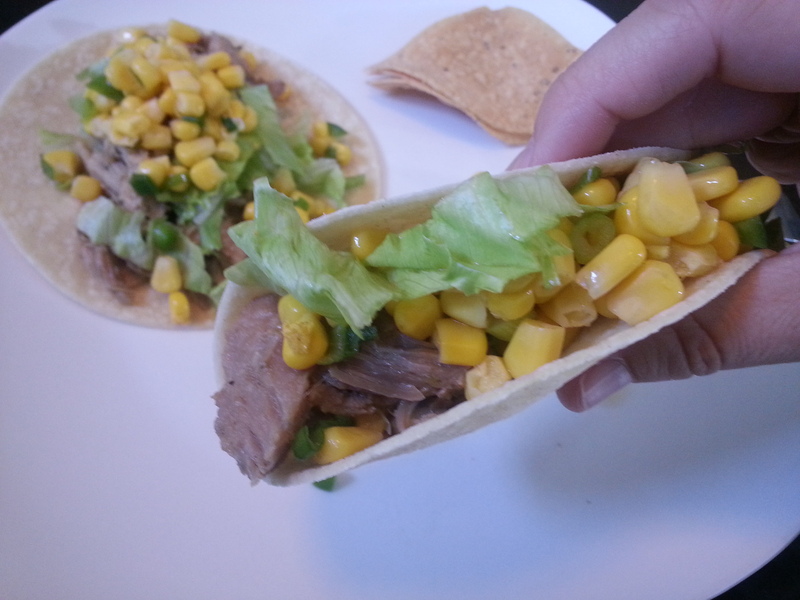 I love the crunch of fried shells but lately, I’ve really been digging warm, soft tortillas when it’s taco time. 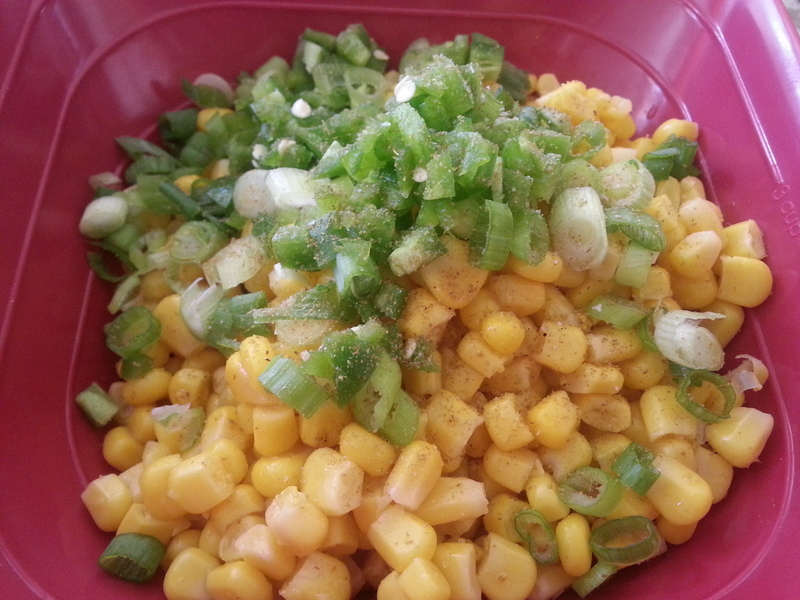 When I pulled out this corn salsa, my husband kind of turned his nose up at it. He’s not one for trying something different and veering away from what he’s used to but he did give it a try, and he agreed. 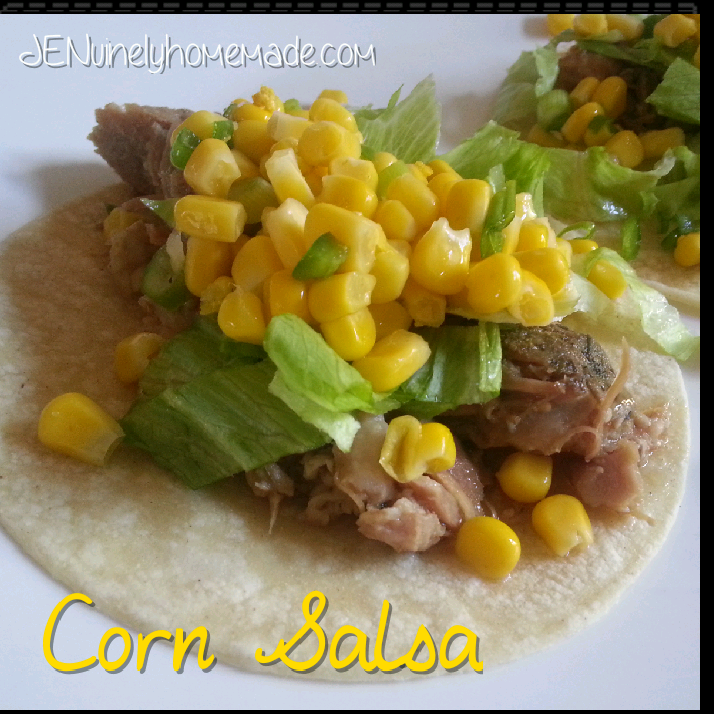 The crunch was much appreciated and the flavor of the corn salsa added that special something. 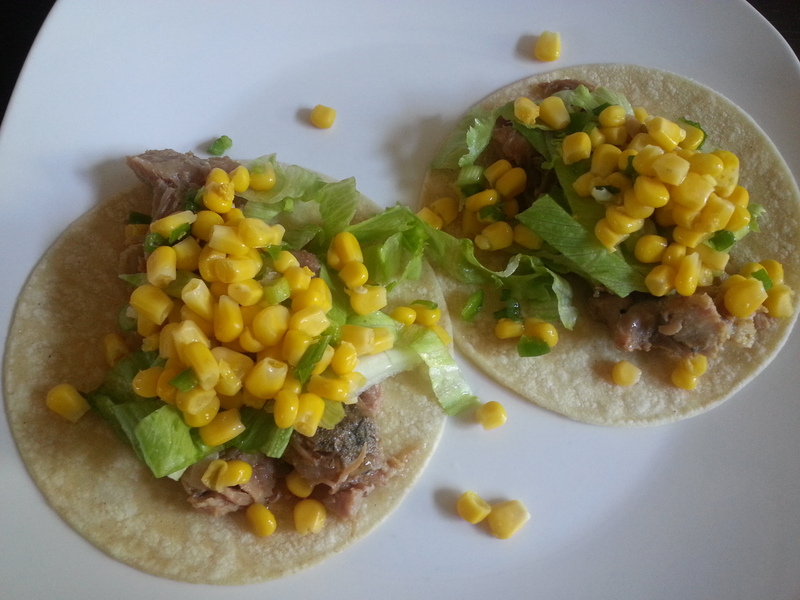 We enjoyed this on green chili pulled pork tacos but it would be great on beef, chicken or even for veggie tacos. 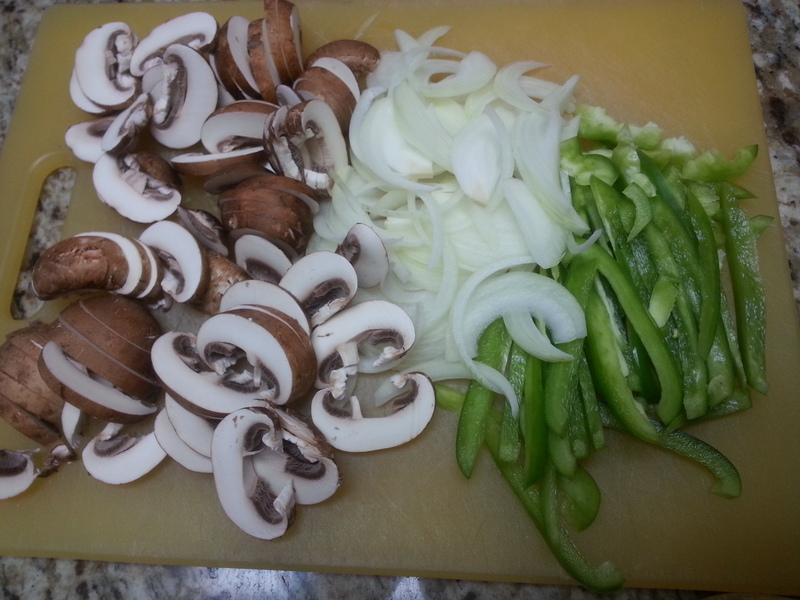 Add all ingredients to a bowl and mix well. Refrigerate until ready to serve on your tacos of choice. And it’s also yummy in burritos!